True Title – Title Service Providers FL. True Title of Florida is owned and operated by the father-son trio of G. Patrick Hand, Jr., Esq., G. Patrick Hand, III, Esq., and Timothy F. Hand, Esq. The Hands’ Mission Statement is for licensed Attorneys and Title Agents to provide their clients with the highest quality title closing and title insurance services available to people within their target market. The Hands envisioned – and carried out – a uniqueness derived from ensuring that an Attorney/Title Agent would be present in the office and serve as the “face” of the company. Louisiana is an attorney state and in many instances, the attorneys only appear for the closings after others have completed the work necessary to get to that point in the sale/refinance/HELOC process. True Title promised to be different in that Attorneys/Title Agents would be present in the title office at all times to run the business; to interact with customers, attorneys, realtors, developers, bankers, other mortgage lenders, and mortgage brokers; to examine the abstracts/title searches; to handle the real estate closings; and essentially to oversee and participate in every aspect of the real estate title operation. True Title of Florida has delivered on its promise time and time again as one of the leading title service providers FL has to offer. Are you in the process of refinancing your current home? Do you need help with home title services? If you have any questions or needs, contact our Attorneys to find out how we can help you easily navigate the real estate purchasing/mortgage process and how we can provide you with the peace of mind you deserve. True Title is a company setting a standard of excellence industry-wide. We at True Title have been committed to excellence in customer service since 1998. G. Patrick Hand, Jr., Esq. (“Pat”), began practicing law in 1965 after being the first person in his very large extended family to become an attorney. Since Pat blazed the trail, more than twenty (20) members of his extended family have followed in his footsteps and have become attorneys. This number includes his sons, Patrick III (“Patrick”), and Timothy (“Tim”). Patrick began practicing law in Louisiana in 1991, and Tim followed in 1997. Tim proposed the idea of starting a real estate title company in 1997, and the three Hands together formed True Title in Gretna, Louisiana on January 5, 1998. Tim runs the day to day operations in the Gretna, Louisiana office. Jean C. Hand, Patrick and Tim’s mother and a former realtor in the greater New Orleans area, has served as the marketing representative for True Title’s Gretna, Louisiana office since it began operations. In 2002, True Title expanded into Metairie, Louisiana. The Metairie, Louisiana office is staffed and run by four attorneys: John Holmes, Esq. ; Sean Pilie’, Esq. ; Malcolm Meyer, Esq. ; and Pete Matthews, Esq. Tim Hand also assists with the day to day operations of the Metairie, Louisiana office. Since its inception, True Title has provided services relating to the closing of real estate transactions in the greater New Orleans area and throughout the State of Louisiana. True Title branched out into the State of Florida on June 17, 2002. During its first stint in Florida, in 2003 True Title was awarded for achieving Presidential Status with Chicago Title Insurance Company in Florida. This was the first time ever that a title company achieved Presidential Status in its first full year of doing business with Chicago Title. True Title duplicated its efforts by achieving Presidential Status for a second and third time in 2004 and 2005, respectively. Despite its booming business in Florida between 2002 and 2007, the real estate and mortgage crash of the mid-to-late-2000s caused True Title to close its Florida doors in 2009. True Title re-opened in the State of Florida on October 31, 2017 and is utilizing the same business model that has formed the basis for True Title’s success in Louisiana for the past 20 years. Patrick, a licensed Title Agent in Florida (Florida Title Agent License No. E038139), runs the day to day operations of True Title’s Florida office. True Title’s Attorneys/Title Agents provide title examination, closing document preparation, title endorsements, notary services, title commitment preparation, loan closing, and the issuance of title insurance policies. These title focused services ensure that any possible errors and omissions related to the title insurance policy are reduced to an absolute minimum after all public records related to each parcel of property are verified. True Title built its business by establishing long-lasting relationships with attorneys, real estate agents, real estate brokers, real estate developers, bankers, other mortgage lenders and mortgage brokers in and around the multi-Parish New Orleans, Louisiana area and the multi-County Tampa Bay, Florida area. This business model has enabled True Title to endure as a successful enterprise through the ups and downs created by the likes of Hurricane Katrina, multiple smaller hurricanes, the BP Oil Spill and the mortgage/real estate crash of the mid-2000s that is still affecting the real estate market today. True Title takes great pride in the knowledge, professionalism, and courteousness of its employees/support staff. We are proud to be your local title service company. True Title is proud to say that our fully trained staff will happily go the extra mile to assist our Attorneys/Title Agents in ensuring that we provide the quality service you and your clients deserve and expect from a professional title company! G. Patrick Hand, III, was born in New Orleans, Louisiana in 1966. Patrick graduated from Christ The King Grammar School in Terrytown, Louisiana in 1980, Archbishop Shaw High School in Marrero, Louisiana in 1984, Louisiana State University in Baton Rouge, Louisiana in 1988, and the Loyola School of Law in New Orleans, Louisiana in 1991, where he received his Juris Doctor Degree. Patrick accepted an appointment to the Jefferson Parish District Attorney’s Office in 1991, where he practiced as an Assistant District Attorney until 1997. While practicing in this capacity Patrick received extensive experience as a prosecutor in Juvenile Court, Traffic (DWI) Court, Drug Court, and in several Felony Trial Divisions. As a prosecutor Patrick tried hundreds of felony jury trials and misdemeanor judge trials. 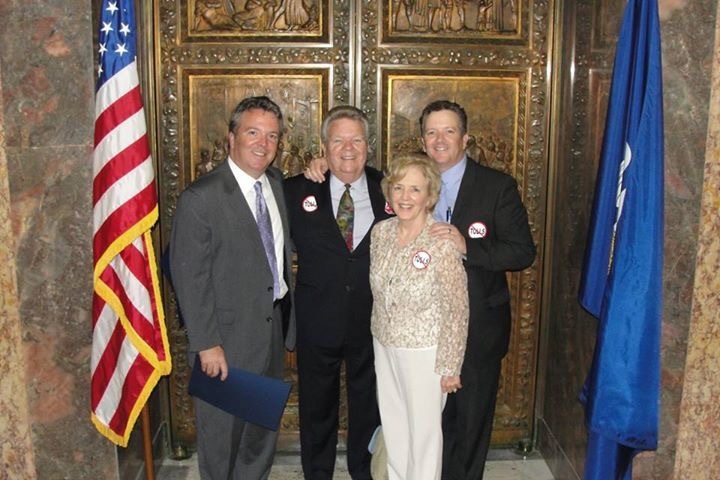 During this time Patrick also engaged in the private practice of law with his father, G. Patrick Hand, Jr. Patrick’s brother, Tim, joined the family Law Firm in 1996, and the three Hands continue to practice together to this day. Patrick is also one of the founding shareholders of True Title, Inc., which was formed in the State of Louisiana in January, 1998, and has its first office located in the same office building as The Hand Law Firm in Gretna, Louisiana. True Title also has a second office in Metairie, Louisiana, and a third office in Safety Harbor, Florida. True Title’s Florida office provides title insurance, escrow and closing services to the entire state of Florida. Patrick has sat as Judge Ad Hoc in Second Parish Court in Jefferson Parish, Louisiana, after being appointed to this position by the Louisiana State Supreme Court. Patrick’s legal practice has included the prosecution and defense of criminal charges; personal injury litigation, primarily as a plaintiff attorney; family law; successions and estates; complex commercial litigation; business litigation; construction litigation; business/asset sales and acquisitions; contract negotiation and real estate abstracting and title closings. Patrick’s biggest and most satisfying accomplishment as an attorney came when he led a large group of volunteers in a successful legal challenge to “Stop the Tolls” on the Crescent City Connection bridge that connects the Westbank of Jefferson Parish, Louisiana to New Orleans, Louisiana. Patrick’s successful “pro bono” effort in court paved the way for the tolls to be eliminated once and for all. Stopping the Tolls on the Crescent City Connection has saved Patrick’s Westbank brethren over $20,000,000.00 per year since March, 2013. Patrick received his Title Agent’s License in the State of Florida in 2002. In his capacity as an owner/operator of True Title’s Florida operation, Patrick was appointed as a Title Agent to issue title insurance policies on behalf of First American Title Insurance Company in Florida (“FATIC”). Patrick also owns and operates Title Search Florida, Inc., a company that performs title search/abstracting work for the entire State of Florida primarily through his website, www.TitleSearchFlorida.com. Patrick is a member in good standing of the Louisiana State Bar Association, the Jefferson Bar Association, the New Orleans Bar Association, and the Florida Department of Financial Services as a licensed Florida Title Agent. Patrick is also a licensed Notary in both Louisiana and in Florida.